Suppliers of hospitality purchasing software. With years of experience as operators, buyers and chefs in the fresh food industry, we know how your world works. We’ve experienced the same operational and financial challenges as you. And we’ve struggled with software that didn’t fill us with much confidence. Until now. 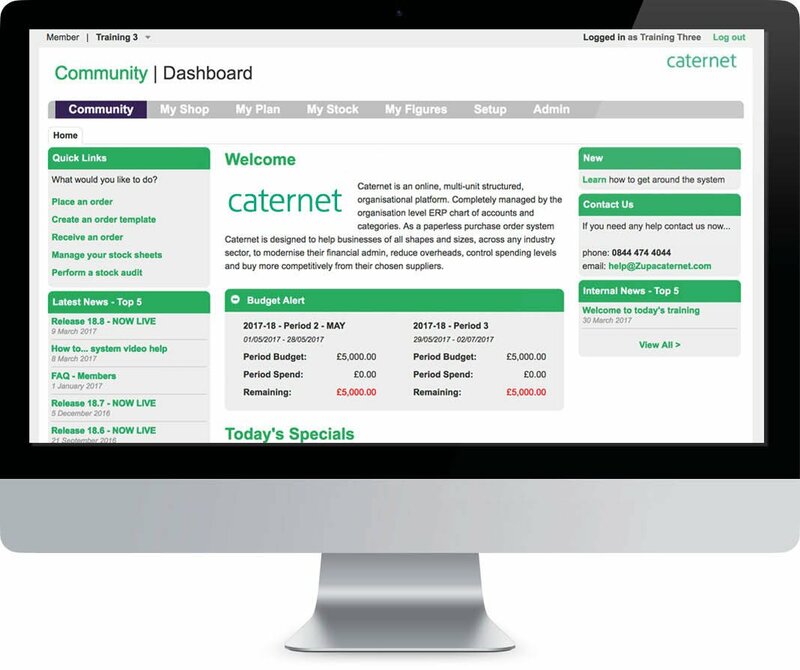 Working with Microsoft engineers and over 2,000 suppliers, we created Caternet – a ‘one stop shop’ web portal that enables you to modernise your purchasing, reporting and financial systems saving you time, money and hassle. What Caternet can mean to you? Prices that are benchmarked thanks to fast, accurate online stock control, live purchasing, forecasting and reporting. And at the end of the week – reduced admin time. Accurate real-time online reporting and HMRC accredited invoices that integrate into your finance software – saving you time and unnecessary paperwork. Live accurate data 24 hours a day, means faster management reports. Leaving you to focus on growth and making precise cash flow projections. 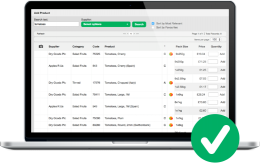 Control your orders, dispatches and payments online, in real-time. Fewer disputes, quicker payments and new relationships. And the best bit? It’s free to trade. Shopping around for the best price may save you money, but it can cost you in time. With Caternet’s live price guide you can guarantee you’re getting competitive purchasing for all your procurement needs, not just food and drink. Our easy to understand traffic light system, enables you to see the high and low prices of comparable products, leaving you free to negotiate what’s best for your operation. Caternet software means you can say goodbye to over spending. 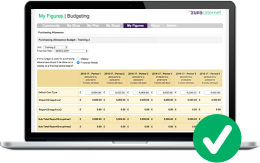 Mirroring your approved budgets and utilising your existing finance system, our software provides you with full control over your spending. 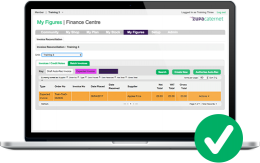 Simply set specific, authorised spending levels at a user, group or departmental level across all your trading locations, and feel rest assured your budget won’t be broken. Eliminating the chance of errors and modernising your reporting and financial systems couldn’t be easier. Our software will replicate your own chart of accounts and facilitate forecasting. You’ll be able to enjoy accurate analytics including stock consumption and profitability right down to item level. And, to make every report easy to track and audit, every invoice adjustment is date stamped approved by HMRC. Relationships are important. So when you’re in the hospitality industry we realise the last thing you want to happen is to be let down. That’s why our software is accessible on all devices and browsers, which means your trusted suppliers can join Caternet for free. Alternatively, if you’re looking for new relationships, Caternet can help there too. With over 2,000 suppliers already onboard with us, it’s easy to discover new ones with our free-to-trade portal. With individual modules, Caternet provides solutions that are intuitive and user friendly. Whether you start with one module or a few, you’ll find they work seamlessly together and will quickly benefit your business. Fully maintained and updated by suppliers, who allow you to accept or reject any cost changes to their goods or services, can reduce your annual spend by between 5-15%. Live online reporting, real time visibility on orders, accurate analytics, and automated control on expenditure means clients like you save an average of 2.5 days per week in admin time. Streamline your activities. Remove manual processes. Eradicate inaccuracies. Benefit from instant data and accurate forecasting that saves you both time and money. Improve your gross profit position with precise control of purchasing spend, stock and analytics. And receive alerts for any price changes, which could affect your expected margins. Remove the concern of meeting current and future allergen and nutrition legislation with our comprehensive recipes and allergens module. Making ordering of supplies more efficient and effective. Inform guests and stay compliant when you add the digital menu publishing tools from Ten Kites. Linking platforms is seamless and we can introduce you.